Going back to when I was a little kid, my parents were gratuitous gift givers. Before I go any further, let me preface this post by saying this is not something I had an issue with. But we received gifts – sometimes just small tokens, but gifts all the same – for almost every major holiday you could think. We were rewarded for excellent end-of-the-year report cards. When I got a new job four years ago, I visited my parents and found a new shirt and tie waiting for me in my old childhood bedroom. That’s just how we did things, and while I certainly never came from money, I came from a family that liked to acknowledge holidays like Valentine’s Day, Easter, etc. with a gift. I should add that I rarely got a gift “just because.” It was almost always attached to a holiday or a significant life achievement. By the time I was a teenager, I was able to figure out that there was a bit of a science involved in determining an appropriate gift for each respective holiday. Christmas and birthdays remained the biggest holidays of all, so there was a lot of leeway, and short of asking for something totally extravagant like a new computer or car, I always felt comfortable asking my parents for certain big ticket items like a new gaming console, a new coat or top-of-the-line sneakers, etc. For Easter, we would normally get an assortment of things in our “baskets” that totaled between $50 and $75, so that’s at least a couple of CDs or movies, an NES cartridge (back in the days), things of that nature. For Valentine’s Day, the tokens were small, but still appreciated. We’re talking the $10-$20 range. So you get a CD or a movie, or maybe gift certificate to the movies or something like that. 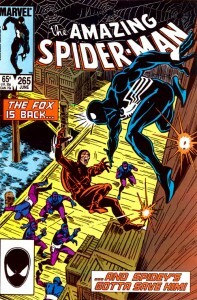 I received my copy of Amazing Spider-Man #265 for Valentine’s Day when I was a teenager. It seems like a silly thing to get for a holiday like that, but my acquisition of this comic book is a constant reminder of some of the advanced scouting techniques for comics that I still apply to this day. A few weeks before Valentine’s Day, I knew my mom was inevitably going to ask me if there was something “small” that I wanted for that holiday. I was browsing the box of back issues at my local comic book store and saw a copy of ASM #265 within the appropriate V-Day price range. 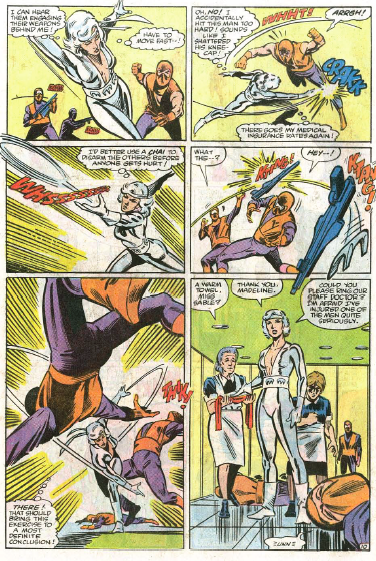 I also knew that this issue was one of those key “first appearance” issues, in this case, the first appearance of Silver Sable. In retrospect, what always makes me chuckle about this issue is the fact that at the time I asked for this comic book, I honestly had no idea who Silver Sable was. I just knew from checking my trusty copy of Wizard magazine, that this issue had a “special” designation as Sable’s first appearance. And since my acquisition of this issue coincided with the “I want it, I want it, I want it” phase of my collector-dom, I went ahead and asked for it. Who cares about the fact that I didn’t even realize that Silver Sable wasn’t the grey-haired mustached-man on the cover, and was actually a female hero-for-hire/mercenary from some imagined-country called Symkaria. On that topic, I would be remiss in adding that Sable has continuously been one of my least favorite semi-recurring characters from Spider-Man universe, which is probably contributing to my less than stellar impressions of the Ends of the Earth storyline thus far. Spider-Man is born from the credo “with great power comes great responsibility,” so having him interact with any regularity with a character who chooses her heroic deeds based on money just feels icky. Additionally, she’s a central character in two of my least favorite storylines from the late 80s/early 90s era, the Sinister Syndicate arc and the Assassin Nation’s Plot. 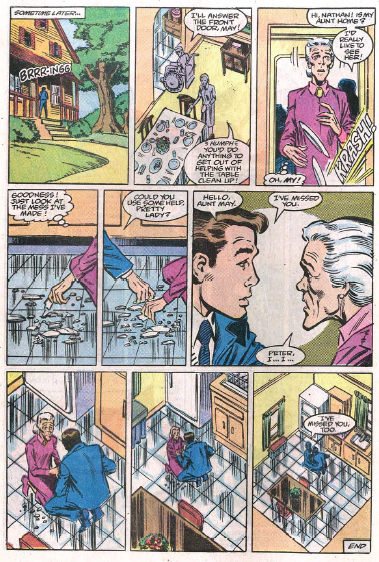 On the positive side, ASM #265 does feature a nice reconciliation story between Peter and his Aunt May, who had not been speaking for a while and that reconciliation is facilitated by none other than May’s then-boyfriend Nathan, who was just a like-able old man at that point, rather than creepy degenerate he became during the McFarlane/Michelinie era of the late 80s/early 90s. So while the Silver Sable element of the story did nothing for me, there was at least a touching finale sequence in this issue. But regardless of my impressions about the story of this comic book, I did receive a copy of ASM #265, along with the customary small box of Russell Stovers candy, from my parents all the same. And now this comic book continues to exist in my collection as a reminder that when my son is a little older, it would probably be pretty cool of my wife and I as parents to continue this tradition and get him a small little something for certain random holidays. If he ends up hating a few songs off that music album, or groaning about a character featured in that comic book, he can at least look back years from now and think more about the gesture of gift-giving than the gift itself. I like the look-back, but why did you spend so much time on what presents you got for each holiday? I hate to have my first post on this site be a negative one & honestly, I’d like to be on great terms with everyone here. But, I don’t understand your complaint about the detail given the backstory about the gifts. To each their own, but that sort of detail is what makes this blog so interesting & entertaining. Without it, it would be just another random blog about comic books. And, ( to me anyhow ) this isn’t just another blog about comics, it’s a blog detailing Mark’s life, his experiences & memories of them as detailed through his love of AMAZING SPIDER-MAN. So, if he were to begin to simply write a dry account with only the most pertinent details regarding his acquisition of each issue, I’d enjoy the blog a whole lot less. That’s how I feel about it anyhow. 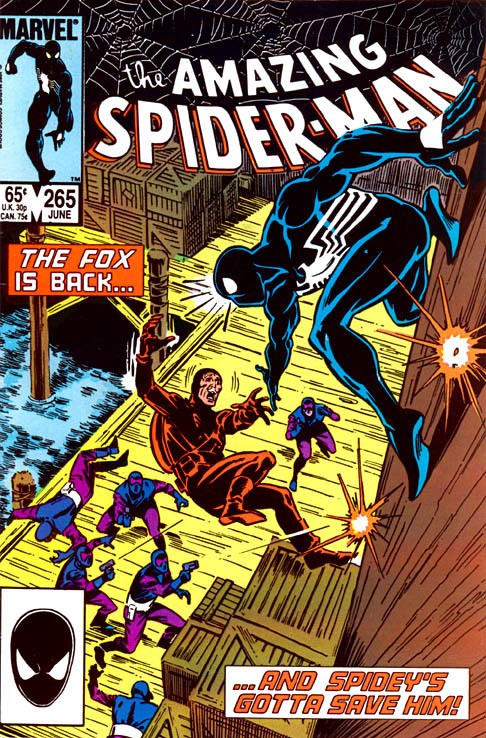 This was the first comic book I ever bought when I was a kid, so in essence, this comic began my comic book geekdom. I met Tom DeFalco (who wrote it) at ComicCon a couple of years ago and had him sign it and told him the story, which was a thrill!